Researchers have figured out how to send thoughts over the Internet using a brain-to-brain connection and a huge magnet. What could go wrong? “In the experiment, two participants (an ‘inquirer’ and a ‘respondent’) played a question-answering game similar to ’20 Questions.’ The respondent is given an object (e.g., ‘dog’) that is unknown to the inquirer and that the inquirer has to guess. The inquirer asks a question about the object by selecting a question (using a mouse) from questions displayed on a screen. The question is then presented visually to the respondent through a web interface. The respondent answers ‘Yes’ or ‘No’” directly through their brain signals by paying attention to one of two flashing LEDs (‘Yes’ = 13 Hz; ‘No’ = 12 Hz). Researchers Andrea Stocco and Chantel Prat say the experiment shows it’s possible to take information from one person’s brain and stick it in another person’s brain without much communication at all. The participants could only send “Yes” or “No” answers to one another, but they got the answers right an astonishing 72% of the time. That’s kind of incredible, considering the inquirer and the respondent were a mile away from each other during the experiment. 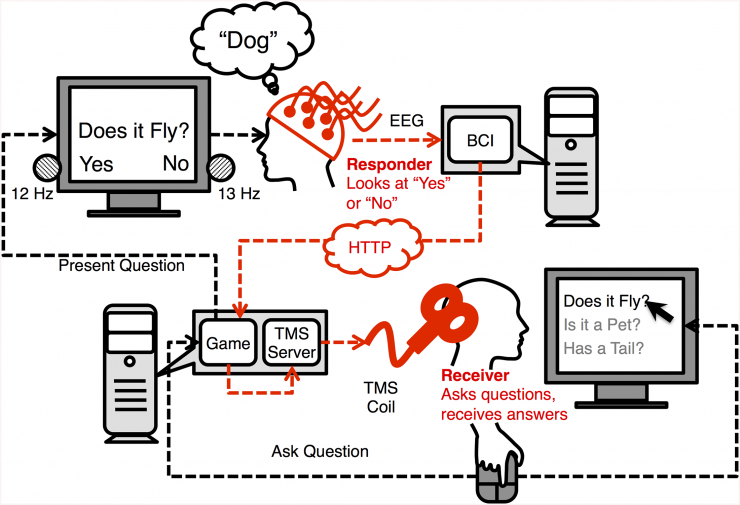 “The questioner sent one of the three questions to the respondent via computer, the respondent looked at the ‘yes’ or ‘no’ light, and that signal went back to the TMS machine. A ‘yes’ answer would elicit a strong TMS pulse, which creates a signal perceived by the brain as a pulse, a blob or a line called a phosphene. The possibilities are endless, both good and, well, terrifying. Iris-scanning technology is being utilized in our schools; we just found out that Twitter may not only read our private messages, but may alter them; some companies are requiring their employees to get microchips implanted; and the government can listen in on our cell phone conversations. Mind-reading could certainly be used for good, but the ways in which it could be misused are endless. We can’t truly “remain silent” during an arrest if we are no longer entitled to our own thoughts, the article notes. This is NOT telepathy. It’s just transmission of electrical signals from one EEG to another, simply put. This is NOT na ESP phenomenon. Period. Telepathy has been recognised by those who are psychic since time immemorial and without the electronic gadgets so typically science is a tad behind. Try reading Psychic Warrior. It is also known that peoples thought processes can be altered with the use of radio waves, the information which is being kept out of the public’s general knowledge.